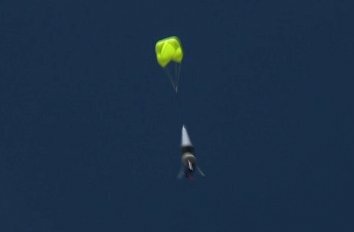 Armadillo's Mod vehicle descends under a drogue chute for several seconds before relighting its engine, in this screen capture from an Armadillo Aerospace video of Saturday's flight. First it was Masten Space Systems, who last month demonstrated an in-flight engine relight on their Xombie vehicle, and now it’s Armadillo Aerospace’s turn. On Saturday Armadillo flew a Mod vehicle on a boosted hop to an altitude of about 2,000 feet (600 meters), similar to flights they’ve done in the past. This time, though, they turned off the engine on the descent for about five to seven seconds before relighting, as can be seen in this video. One difference between the Armadillo and Masten flights is that the Mod deployed a drogue during the time the engine was off, apparently to keep the vehicle from tumbling; it worked, although the vehicle did appear to swing around quite a bit. Once the engine was reignited and the drogue released, the vehicle made a normal descent and landing under rocket power. W00t! It’s been a phenomenal week for NewSpace!